LOGAN — While it is common for a pair of brothers to play together on the same college football team, it's not often you see a pair of brothers line up against each other on opposing sides to open a season. That will be the case for Cody and Tyler Larsen. Cody is a senior defensive tackle at Southern Utah. He is a preseason 2nd team FCS all-American whose two sacks and forced fumble helped the t-birds crush UNLV last season 41-16. 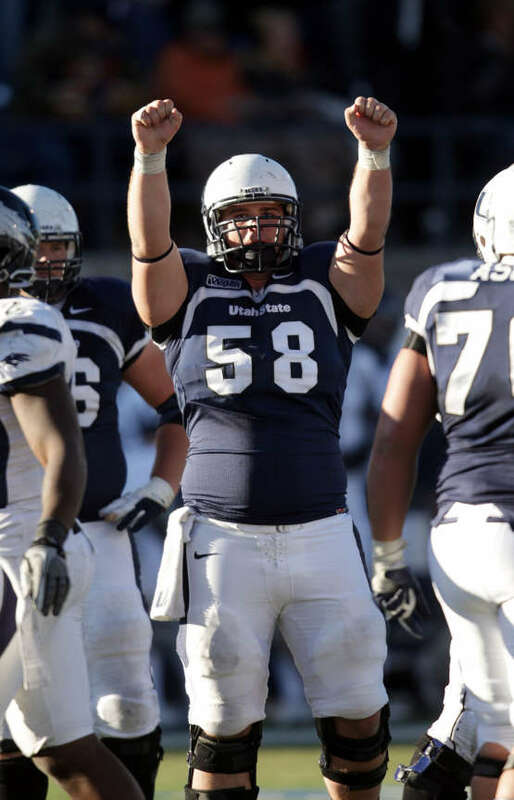 Tyler is a junior center at Utah State. He is on the Rimington Trophy Watch list for a 2nd straight season, the award given to the top center in the nation. He has started 25 straight games and is considered an NFL prospect. These brothers have been competing against each other for years within the walls of their own home. Their sibling rivalry helped them develop into the players they are today. "They competed against each other," says their mother Barbara Larsen. "That's what brothers do." "There were a few small injuries," Cody recalls. Their father LeRoy recalls several competitive moments between his two oldest sons. "Didn't Cody throw Tyler through the wall?" he asks his wife. "He was always a little bit bigger than I was," Cody recalls. "So I would always have to show him up being the older brother." Their sibling rivalry has developed in to a deep bond between the brothers who have enjoyed supporting one another as they have achieved their dreams of playing college football. "They have grown so close now," their mother says. "They're best friends." These best friends are preparing for Thursday's season opener in Logan. They will be lining up across from each other as opponents for the first time. They admit that first play of the game will be awkward. "Yeah it's going to be," Cody admits. "And being the older brother, if he gets one on me, if I get pancaked or something I will never hear the end of it for the rest of my life so I can't let it happen." As soon as they saw the 2012 schedule the trash talk between Cody and Tyler began. "We've been texting each other our weightlifting numbers throughout the entire offseason," Tyler says. "This is how much I'm lifting, how much do you got? It's a non-stop thing going on right now." The family gathered for Sunday dinner dressed in Utah State and Southern Utah shirts. One member of the family even wore a "half for Utah State" and half for SUU" t-shirt. They can't wait for the rare opportunity to watch Cody and Tyler play against each other but Barbara admits it will be hard for her. "It's really hard for me to watch them play against each other but I'm so grateful too," she says. "They've had so many opportunities because of this." It will be a proud moment for their father LeRoy, who coached his sons in little league football. "It's the icing on the cake here," he says. "From little league to high school to now and to see them play at this level and against each other it's just going to be fun."